Hong Kong is an amazing city. This is our third visit, and we still have barely scratched the surface of what there is to see here. The excursion we chose was ‘Lantau By Sky Rail’. We did go to Lantau, but it was by bus because the skyrail broke down on the Chinese New Year, and still had not been fixed when we were there. 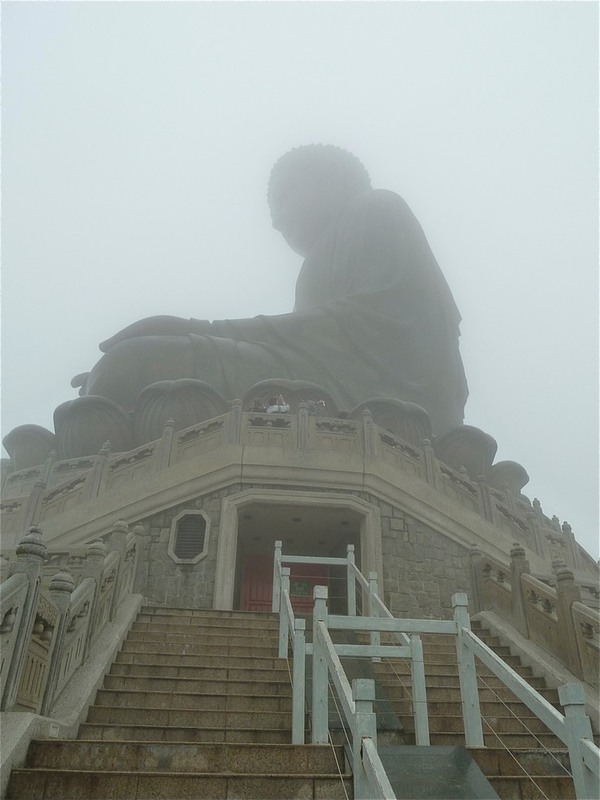 The point of the trip was to visit the Big Buddha or Tian Tan Buddha, a bronze sculpture which is one of five large Buddhas in China (photo below). The day we went it was foggy and raining, so we never could see the Buddha’s face clearly. We did climb the 250 steps up to the monastery, and another 22 steps to the base of the Buddha, so we got our exercise for the day. The walk to the stairs is lined with the twelve spiritual generals who represent the signs of the Chinese zodiac. In the building under the Buddha there is a museum which also has a place where people can leave offerings. The whole park is very beautiful, even on a day with bad weather. The park with the Buddha is located next to a shopping village which also has a display of cable cars from around the world. On day two we had no specific plans other than to go to the Harbour Center Mall (where we were docked) to see if we could find a watch battery. In the mall we encountered our table mates, Ted and Helena, who told us about a great park with an aviary, out on Nathan Road. We decided to check it out, and almost missed it, because the entrance is not clearly marked. The park is a large oasis in the middle of an extremely busy city, and is just beautiful. We found the aviary, and even better, a pond with lots of birds to watch. Unfortunately, this was a spur of the moment trip and we did not have our cameras with us. We want to go back to visit again when we do have our cameras. In the afternoon we spent some time watching the harbor activity - both construction and ship. 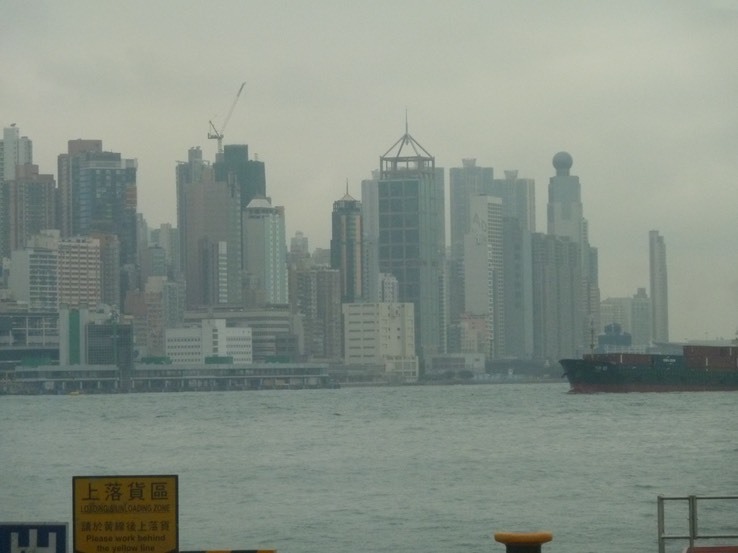 Those waterfront properties on Hong Kong Island will very soon not all be on the waterfront, as they are reclaiming land in several areas. Actually, it seems more like creating land. Of course the Star Ferries were plying the water on a frequent basis. We watched tugboats maneuver barges into position for unloading their cargo for the land-building project (see above). Perhaps our favorite sight was the barge pictured here, which was loaded with cement trucks. We watched it go by several times, so apparently loading the trucks onto a barge is the cheapest way to get them between the work sites and the plant where they could be refilled. As you can see from the photos, the weather on day two wasn’t much better than it was on day one. And it was chilly. After spending quite a few days in the tropics, we weren’t ready for that. We will be happy to re-visit Hong Kong any time we get the chance. In the meantime, you can see more photos in the album.